Kjell Steinsvik founded the company Hustad Kalk og Marmor AS in 1948. The company produced calcite marble for agricultural use for the neutralisation of acidic soil in relation to the development of marshlands into arable land in Tverfjell in Fræna. Kjell Steinsvik was a socially engaged editor of the local newspaper Romsdals Budstikke. 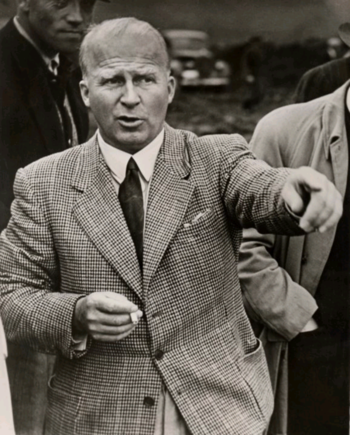 In 1946 he launched the Hustad Plan. This was a comprehensive plan to transform the marshlands into arable land to help better the livelihood for local farmers after the war. The plan was to cultivate as many as 160 000 acres in Møre og Romsdal with the help of draining and liming. Hustad Bruk AS was founded as a cooperative enterprise. Hustad Bruk AS founded the subsidiaries Hustad Jord AS and Hustad Kalk og Marmor AS. Hustad Jord was going to cultivate the marshlands and create the basis for 400 privately owned farms of 400 acres each. Hustad Kalk og Marmor AS was going to produce agricultural calcite marble for the cultivation. The goal was that 4 and 4 owners would work jointly on 1 600 acres, sharing machinery, farm buildings and loose housing for free range farming, creating the possibility for large, rationale agricultural units. The Hustad Plan was revolutionary and attracted considerable criticism. Eventually the grants for the cultivation intended to be the foundation for the new sustainable joint operations that were a prerequisite for the Hustad Plans were revoked. When the cultivation grants were withdrawn the cultivation stopped, and Hustad Kalk og Marmor was heading towards bankruptcy. To avoid bankruptcy and save jobs, Kjell Steinsvik resigned as editor of Romsdals Budstikke, took out a mortgage on his house, and assumed ownership of Hustad Kalk og Marmor. The years that followed were difficult, and when Kjell Steinsvik (56) became seriously ill, his son Sturla Steinsvik (17) joined the company.